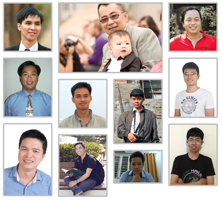 We are a small team of less than a dozen, scattered around different regions of Vietnam, U.S.A, and Ukraine. We don't come to an office to work. Instead, we work via Skype, Github, email, Google Docs, and Dropbox. We love challenges. We enjoy making things impossible possible. We keep pushing our limits, everyday. Notes Plus is our flagship product. It has been an indispensible productivity tool for hundreds of thousands of users worldwide for many years. INKredible is a wholly different approach to handwriting on tablets. It's just like paper, but better.